A spectacular native rainforest tree for large gardens. 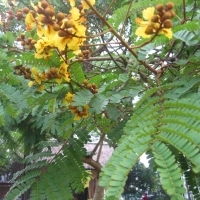 Bright green, shiny, palmate shaped leaves with red bell-shaped flowers in summer. Flowers best after a hot dry summer. Tolerant of most soil types and positions. Fast growing excellent feature tree for tropical and subtropical gardens. Spreading tree with a rounded canopy and dark green ferny foliage. Spectacular sprays of crinkled, yellow flowers are held on long stems above the foliage, and have a pleasant fragrance, smothering the tree in Spring. Long, dark red seed pods follow, and remain on the tree until flowering begins in again. 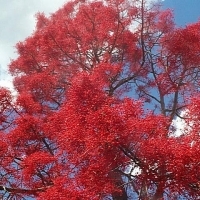 Australias most spectacular flowering rainforest tree with brilliant red flowers in mid spring. 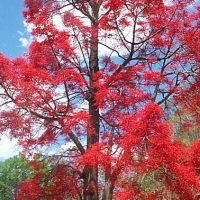 Superb shade tree and very hardy, will grow in most regions of Australia. 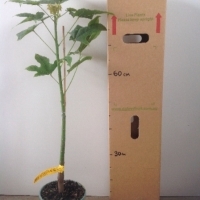 Grafted trees will flower within 3 years and selected from a vibrant flowering selection.